The Sender » Advanced tab lets you set advanced settings. The Domain Filtering box lets you enter a set of rules to indicate whether a message which is waiting to be sent should be sent using this Mail Sender or not. For instance, this may be useful if you want to send mail from different domains or email addresses through different ISPs. It can be used for other things as well. Check the Domain Filtering article for more instructions. The EHLO/HELO name is the name used by VPOP3 when it sends an EHLO or HELO command to a remote server. By default it uses the VPOP3 Host Name set in the Settings » Misc Settings » General tab, but you can customise it for a particular sender here. If the Only send messages waiting at start of connection box is checked, then VPOP3 will only attempt to send the messages which were in the Outgoing Queue when the connection started. If this box is not checked, then when VPOP3 reaches the end of the connection it will perform another check to see if any more outgoing messages have arrived. If so, it will attempt to send those, then check again for any further messages, and so on. If the Send smaller messages first box is checked, then VPOP3 will send smaller messages before bigger messages. If this box is not checked, then VPOP3 will send messages which arrived in the Outgoing Queue first. If the Reverse send order box is checked, then VPOP3 will send messages which arrived in the Outgoing Queue more recently first (if the Send smaller messages first box is not checked), or bigger messages first (if the Send smaller messages first box is checked). For the above two settings, note that outgoing messages can also have priorities assigned to them based on who sent the messages (configured in the User's Advanced settings tab). These priorities override any other ordering. Also, you can use Lua scripting to adjust sending priorities at runtime. The Sender Retry box lets you specify when VPOP3 should try to send messages again, if previous attempts have failed. This is a list of time periods (in minutes) between try attempts. For instance, in the example shown (10, 10, 10, 30, 60, 60, 60, 180) this means that the second try will be 10 minutes after the first, then 10 minutes after that, then 10 minutes later again, then 30 minutes later, then an hour later, then another hour later, then another hour later, then three hours later. After that VPOP3 will try every three hours (the last number in the list is assumed to be repeated indefinitely). Note that these times do not override the connection scheduling. If VPOP3's schedule is only set to send messages every hour, then there will be an hour between the first and second retries, and so on. The Max Retry Time tells VPOP3 how long it should keep trying to send the message before failing it and sending a delivery failure message to the sender. The default is 72 hours which is usually the minimum recommended time (this allows for situations such as the recipient's mail servers failing on a Friday and not being fixed until the Monday). The Warn after time tells VPOP3 that if a message has not been sent for this amount of time, then it will send a message to the original sender, telling them the message has not been sent yet, but it will keep on trying. 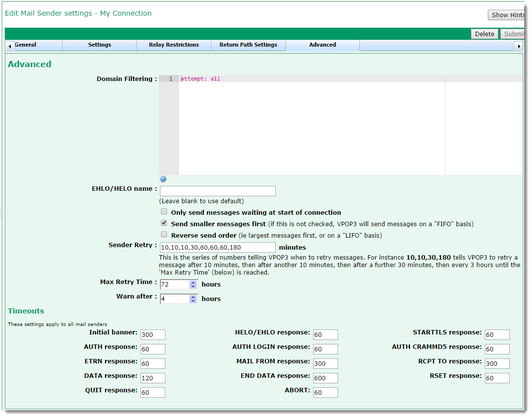 The Timeouts values set various times which VPOP3 will wait for responses from the remote mail server, depending on the state of the connection. The default values are taken from the relevant Internet standards where appropriate, so will normally not need to be changed.